I’m sure you probably have heard that compounding can help grow your account geometrically. But the normal way of compounding can take some time to grow your account. My method of using compounding takes it to the extreme to grow your account much faster without increasing your risk greatly. Here, I would like to share a strategy which, if used properly, can help you grow your account pretty quickly. It introduces compounding into your money management strategy. If you have $10,000 invested and it gives you a rate of return 20% every year, you will have $380,000 at the end of 20 years by re-investing the profits (i.e. compounding),while you will only have $50,000 at the end of 20 years without compounding. You can see that compounding increase our total account by more than 6 times. Okay, let me move on to talk about using compounding in Forex Trading. But, first let me digress a bit. For those who are not familiar with R-multiple concept, let me explain a bit on that. It was introduced by Dr Van Tharp. ‘R’ is simply the dollar risk per trade. It’s nothing but a reward-to-risk ratio. Let say you risk $100 dollar per trade to make $500. Your risk to reward ratio is 1 :5. Your risk is 1R and your reward is 5R. 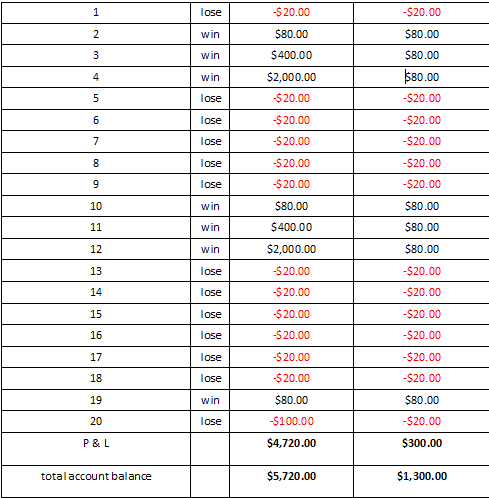 Another example, you are risking $1000 dollar per trade to make $500. Your risk reward ratio is 2:1. Your risk is 1R and your reward in this case is 0.5R. We always take our risk as 1R and calculate your reward in terms of R-multiple. As you can see the huge potential comes with incorporating compounding into your money management strategy. You are simply ‘reinvesting’ your previous profits into your next trade and expotentially increase your profits for the next trade when you are on a winning streak. The higher the risk reward ratio and the higher the initial dollar risk per trade, the greater effect compounding has on your overall profits of a winning streak. What kind of trading strategies can compounding strategy be useful for? Take Note: Compounding Strategy is not used to turn a losing trading system into a profitable trading system. It is used to increase your profits and grow your account faster for a profitable trading system. Example 1: Trading Strategy A with a Risk Reward Ratio of 1:4 and Win ratio of 35%. It frequently has 3 winning trades in a row. Our starting trading capital is $1000. Our risk per trade(1R) is $20. Example 2: This is just a hypothetical scenario where winning trades and losing trades alternate. Our starting trading capital is $1000. Our risk per trade(1R) is $20. With a compounding strategy, an originally winning trading system turned into a losing trading system because it doesn’t fulfill one of the two important prerequisite which is high occurrence of consecutive winning trades. 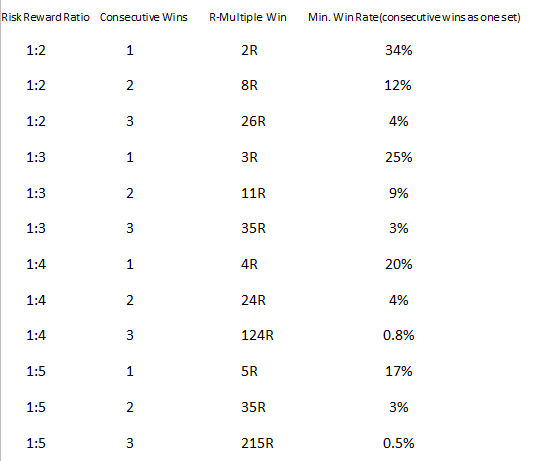 As you can see, the higher the initial risk reward ratio brings you a much higher overall r-multiple win with more consecutive winning streaks. For example, if you risked 1:5 and aim to get one set of 3 consecutive win streak, all you need is just 1 winning set in 216 trades to be profitable (roughly a win rate of 0.005%). Try out in your own trading and let me know how it goes! I know the “R” that Dr. Van Tharp introduced. But I don’t think it can work out if you try to compound with every of trade. Let’s say I have 70% of winning strategy, but we always don’t know which of our trade will goes, the 70% or part of 30%. Maybe I am kinda conservative, and I will prefer to compounding it by monthly. At least it is more comfortable, and I am not putting all my hardly earned egg in only 1 basket. Just my 2 cents view. It can also screw your account faster than not using compounding should you hit a losing streak of greater than 50% win rate. As you said, anything less than a 50% win rate and compounding will not be of benefit (i’m talking about compounding after each and every trade, not at the end of a certain period such as each month end). Compounding is basic stuff really - but has nothing to do with trading successfully. Yes, each and every trade will definitely screw the account even faster. Monthly are more acceptable to me, because sometime bad week do occurs a lot. Example 2: Trading Strategy B with a Risk Reward Ratio of 1:2 with a win ratio of 50%. it rarely has consecutive winning trades. Our starting trading capital is $1000. Our risk per trade(1R) is $20. Wouldn’t it be great if the real world we live in worked excately how mathematicians explain theory. Unfortunately that’s excately what is theory. Risk equals reward. Get greedy and go chasing higher rewards and you end up blowing your account. Interesting read as a post. But I would like to shake the hand of the man with the balls big enough to implement it into their trading strategy. maybe I didn’t explain myself well. What I meant is that this is a different approach that you can consider using if your trading strategy tends to produce winning streak quite frequently( based on your back-testing and forward testing and live trading data). please take note that[B] it is not compounding after each and every trade. [/B] you only compound after you had a winning trade, with the expectation that it will likely produce a winning streak(this expectation is again based on your testing results). If you had a losing trade, you still stick to your original risk per trade, so you have the same amount of risk when you hit a losing streak, regardless of whether you are using compounding or not. Again, this is not to make your trading strategy profitable. this is not to help you trade well either. this is just an alternative approach for you to think about when you are trading profitably and you are looking for a way to grow your profits faster. Hi, I am testing this technique now. I am sharing it on this forum for all to discuss. if anyone is interested, can discuss with me on this thread. I believe this forum is for everyone who is interested in forex trading to share and learn from each other. Your post was a fun read. I agree with most of it. However, I think you ran off the rails with the sequence of wins and losses which you assumed in your Example 2. In your Example 2, you assumed a risk-reward ratio of 1:2, a win-ratio of 50%, and a perfectly regular sequence of wins and losses. The sequence of wins and losses is not influenced by the risk-reward ratio, so we can ignore that. However, [I]the sequence is greatly influenced by the win-ratio. [/I] A win-ratio of 50% is [I]the proverbial coin-flip,[/I] in which heads and tails each have a 50% statistical probability. Where I think you went astray is in the uniform [I]winner-loser-winner-loser-winner-etc. [/I] sequence which you assumed in your Example 2. A real-life sequence is random, and therefore highly irregular, unlike your uniform sequence. Here is a Coin Flip Simulator which will illustrate this randomness. 13 strings of 2 heads, 7 strings of 3 heads, 3 strings of 4 heads, 1 string of 5 heads, 1 string of 7 heads, and 1 string of 10 heads in a row. Here’s an interesting way to look at these results: Out of 200 coin-flips, 81 flips were part of a string of heads (winners). You can run your own simulation as often as you like, and you will get various sequences of heads. But, generally, there will be many instances of 2 heads in a row, fewer instances of 3 heads in a row, fewer still of 4 heads in a row, etc. But, you won’t see many strings of the form H-T-H-T-H-T-etc., such as the uniform sequence you assumed in your Example 2. Also, in general, higher win-ratios correspond to more frequent and longer strings of winners (and less frequent and shorter strings of losers). As we’ve said again and again on this forum, improving your win-ratio is THE most potent way to increase your profitability. I have never tried the sort of “compounding” you are advocating, but I think it’s worth a serious look. The problem I described with your Example 2 does not invalidate your theory. In fact, it might strengthen your theory, because there are more opportunities to capitalize on strings of winners than you have assumed. Thanks very much for pointing that out! I will go amend the example shortly. I wanted to give an extreme case where compounding is not suitable when winning trades and losing trades alternate or there is no string of winning trades. sounds similar to what I posted a while back in the strategy section. Just went over to the blog you referred to. Very well written post and very good ideas posted by the blog owner. I am very interested to implement this compounding strategy in a trend following trading system to see how it goes. Thanks a lot for pointing me to the website! May I know if you are experimenting with pyramiding in your own forex trading? I don’t want to sound pessimistic but I think that it is not possible to grow your account fest without increasing the risk. And by increasing the risk you are increasing the chances for blowing up your account. Nice idea. But let me ask you a doubt. 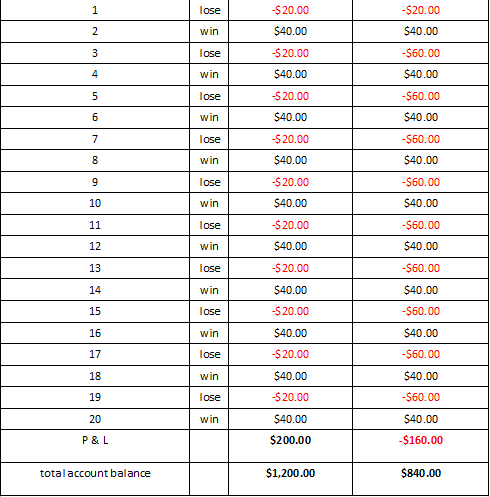 After winning 2000$ in the example, why are you losing just 20$ instead of 2000$?